EDITION REVIEWED - J. A. Allen paperback. Originally written as 3 separate books, and this edition continues to separare them into three parts. At the start of the book Grace has been sent to yet another audition by her agent. Since leaving acting school she has yet to find a real acting job. When it comes to her turn the scriptwriter of the TV drama she is auditioning for takes a liking to her but she finds out she must be able to ride for the part. She assures them she can, despite barely being able to sit on a horse - and so gets the part. She is worried by the fact she has lied and she is also having problems with her old boyfriend Richard whom she has broken up with in order to pursue her career. She still has feelings for him and is jealous because he has taken up with a glamourous blonde. Then things get even worse when she has to do a screen test and finds out it is at a local park on a horse! But despite the test being complete chaos and a horse being injured in the fracas, Grace keeps the part - on the one condition she has to go on a riding course. Grace arrives at Moat Farm Stables to be taught by Angel Sylvester. She finds out the stables supply horses to the film industry. Then she meets Grace's brother Anthony and finds out he is the handler of the horse she caused to be injured in the screen test, The Comet. Initially he is hostile to her, thinking her an empty headed career girl, but in time as Grace learns to ride and look after the horses she begins to feel an affinity with them, and Anthony begins to soften towards her. She is also drawn to him, but this is complicated by the fact that Richard is still on the scene and that Anthony has a bad reputation with women. Grace begins to film the drama. But when The Comet is injured he has to be replaced by The Blizzard, a stunning horse who was rescued because of his skill but has been labelled a rogue. As Grace begins to fall in love with the beautiful horse and finds herself swept up in the make-believe world of the film, fantasy and reality begin to blur and she starts to see Blizzard as the fantasy horse he is playing the part of, rather than the real flesh and blood creature. Can she accept reality before disaster strikes...and if so will that acceptance sour her ambitions to become a star? I have chosen this book rather than Caroline's other better known novels partly because it is one of my favourites, partly because it is more unusual than her others, and also because arguably it contains more depth than the others (bar Flying changes). Originally, when published as as a 3 part trilogy, it was not even marketed as a pony series, but although the central plot is about acting, it is nevertheless firmly horse-orientated. position of transition between the two types of book. Although not as dark as Flying Changes it does have far more serious moments than her other books. But if we look more closely at the characters, plot and themes of the story we see it follows very closely along the lines of her Eventing books. We have snatches of the characteristic rather bizarre Akrill humour which is mainly centred around eccentric characters and odd situations. Angel is rather reminisent of one of the Fanes in the Eventing books, and there are other odd characters such as Ziggy the agent, and Emma, the would-be singing star. But it is the predominant themes in both series which draw them both together and in fact seems to connect amost all Caroline Akrill's books. The main theme which Caroline Akrill seems most interested in is the choice between career and, (for want of a better word), real-life. This is partly reflected in the way that both Elaine and Grace find themselves in a tug of war between relationships and their careers, with Grace choosing acting over Richard as Elaine initially chooses her riding career over her friendship with the Fanes when she leaves their employ. But more subtly is the message that something far more important than relationships may have to be sacrificed to achieve one's goals: intergrity and values may also have to be swept aside. In the Eventing trilogy Elaine finally realises that she cannot give up her values, her friends and her family, and chooses them over her career. In Flying Changes we have the opposite in the character of Oliver who chooses career and becomes a cold, unloved character who eventually finds his choice leads him to tragedy. In The Silver Bridle we see something between the two. Grace is faced by the same choices. As she becomes closer to the horses she rides, she finds it hard to accept the sometimes harsh realities of a horse's role in the film world. Can she continue to work in a world which sees horses as expendable? This worry is centred upon The Blizzard, and as Grace does not want to accept what may happen to him, she retreats into a fantasy scenario. The ending of the book is less clear cut then in Eventers or Flying Changes, we are not really sure what Grace plans to do? Has she with the help of Anthony (who combines his deep love of his horses and his work) managed to reach a compromise, or will she give up her acting? That is left to the reader to decide. In this way it perhaps discusses these choices in a more subtle way than in the other books. I said earlier that I think this book has more depth than her more popular novels. This is seen mainly in the character of Grace and her reaction to her unsettling feelings. We see her retreating into fantasy as she becomes more involved with the world of the film she is making. This is brilliantly done by the author who in an innovative bit of narrative structure, has Grace telling the story of the film's character Eileen in the first person. The fantasy world has safer and nicer characters than the real one. Eileen's sister in the film is loving and kind, but the actress who plays her is actually quite an unpleasant character, but especially it is the horse who is a magical life-giving creature in the film world as opposed to a human-hating rogue in reality. Grace is overwhelmed by her feelings. Perhaps she had always been a little self-cented, but by learning to care for horses and understand their feelings she is becoming more aware of others emotions, both human and equine. As with many pony books contact with horses turns a character into a better person, but Ms. Akrill gives far more depth to this theme than the average pony book in showing that by doing so Grace is finding that life is not as clear cut or easy to understand as she had once thought. Incidentally this section is also great storytelling as the reader gets a story within a story as the tale of Eileen also begins to unfold. In fact you almost wish you could read the whole story! Possibly this book won't be as well liked by those readers who loved the other Akrill books for their humour but i think in this novel we see the author experimenting a little and taking both her characters and the reader to a new and different level. As the book's main character is not initially horsy there is a little less equine content than in the author's other books, but in those sections which involve horses, Caroline's experience as a horsewoman shines through, and these sections are entirely convincing. Unlike her other books which concentrated more on the competition side of the relationship between horse and rider, this book looks more at the personal relationship between them. Grace feels herself growing closer to the horses she rides and looks after, in particular The Blizzard, and as we have discussed earlier it is this closeness which causes her to question her values. The relationship between girl and horse can almost be likened to a romance and in The Silver Bridle, the author presents the reader with the double romance of Grace falling in love with both horses and Anthony at the same time. hardly surprising when you consider how close Anthony is to his horses. Once again the author asks the question which all of us have asked ourselves at some time, be it jumping, eventing, racing or in this case film work, is it actually in the best interests of the horse? This was also explored in Ticket to Ride when Elaine finally questions how punishing the training schedule can be to a horse. 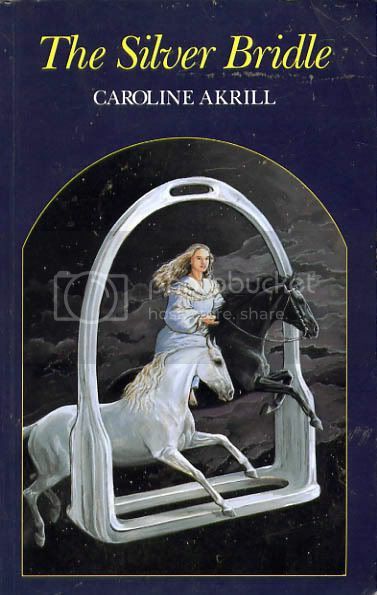 In the Silver Bridle both viewpoints are put across, with The Comet showing as loving his work but with the past history of horses being exploited in films also highlighted, leading the reader to believe that perhaps Ms. Akrill herself is undecided in the matter. Caroline may have a slight penchant for devilishly handsome masterful types! Anthony is slightly more rounded a character than Richard, but he never really comes across as wholly convicing to me, as compared to the female characters which are all superbly portrayed. Therefore the romance between Grace and Anthony is slightly dull, certainly the dramatic way she falls in love with the horses is much more compelling. But these are just very small quibbles. In general this is a superb horse story which is particularly suited for adults who will benefit more from the subtle themes of the book than the younger reader. At the same time as delivering profound insights into life and feelings, Caroline also manages to give it a light and humourous tone with quirky characters and funny scenes. A brilliant combination of light and dark and of entertainment and serious thought. I would rate it as 5 horseshoes. This looks like a brilliant book, and i'd love to read it, but just serched it on Ebay, and one section is £102!! Is the version with all 3 parts a cheaper, newer edition? Never realised that there were three parts!!!! I read the last part and thought it was a book on it's own.